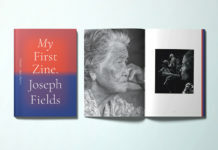 A drop cap adds a professional flourish to any layout, whether you’re designing a magazine, poster or book. 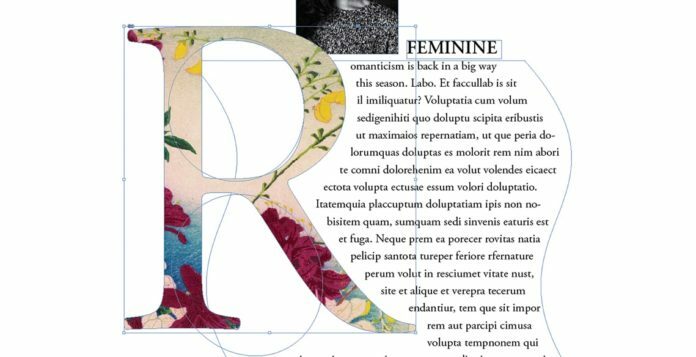 This fundamental typographic skill isn’t difficult to master—once you know the basics you can develop your drop cap designs and create jaw-droppingly beautiful results. 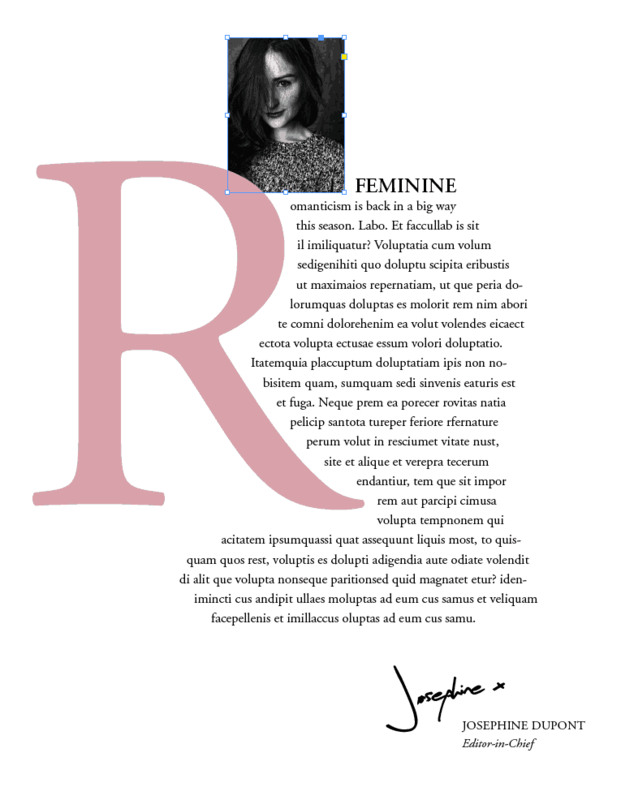 With your InDesign document open, you should first prepare a text frame on your layout using the Type Tool (T). 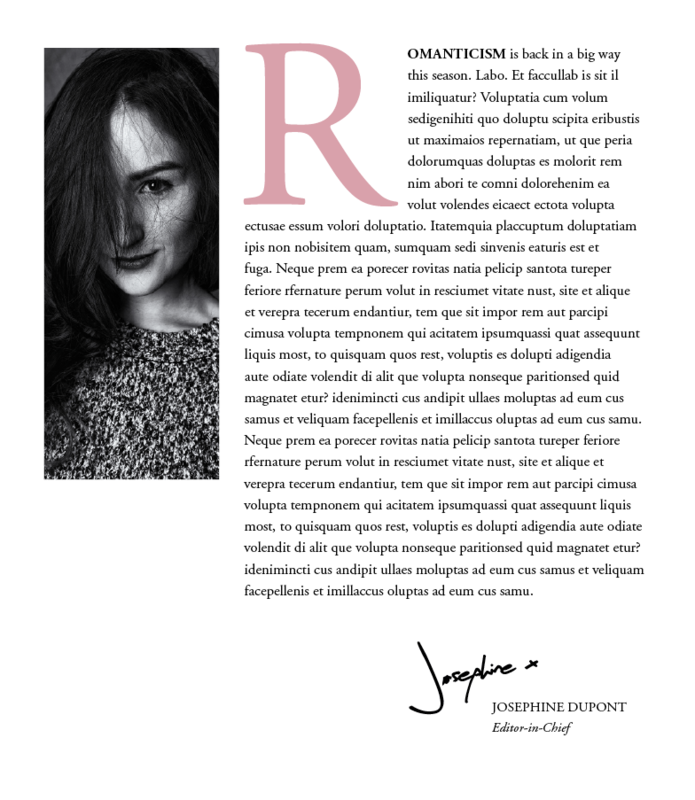 Fill the frame with the paragraph of text you would like to add a drop cap too. Highlight with your type cursor the first letter of the paragraph, or simply place your cursor somewhere into the paragraph. From either the Paragraph Formatting Controls panel running along the top of the workspace or from the Paragraph panel (Window > Type & Tables > Paragraph), locate the Drop Cap Number of Lines option (indicated by an uppercase ‘A’ in the corner of a sequence of lines). 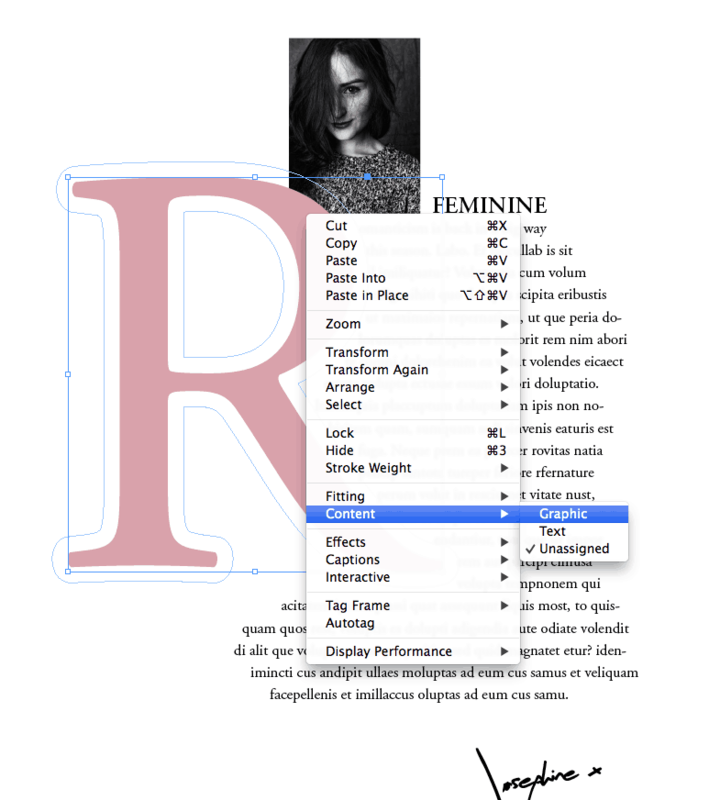 By clicking the arrows up or down, or by manually typing in a number, InDesign will set the drop cap to extend a specified number of lines, increasing the size of the character as it does. You can also adjust the number of characters included in the drop cap by increasing the value of the Drop Cap One or More Characters, an option which you can find in the bottom-right corner of the Paragraph panel. This is perfect for when you want to pull out a whole word or phrase as part of your drop cap effect. 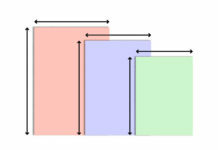 First, go to Window > Type & Tables > Story, and check the Optical Margin Alignment box. 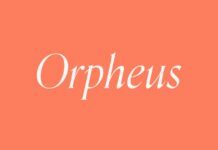 This shifts any straggly serifs or apostrophes to outside of the text frame, giving the whole paragraph, including your drop cap, a cleaner appearance. 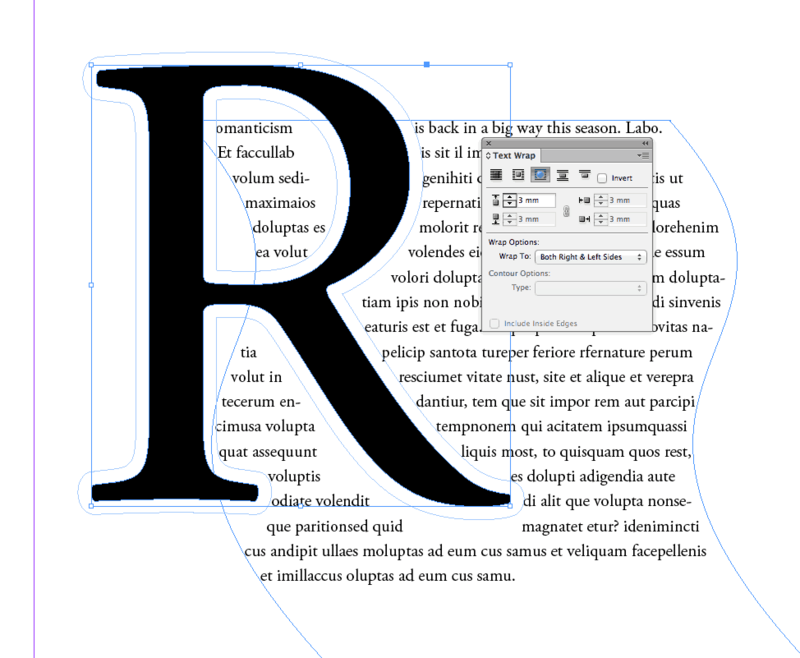 Is your drop cap crowding some of your paragraph text? Here, the tail of the ‘R’ is overlapping some of the body text. 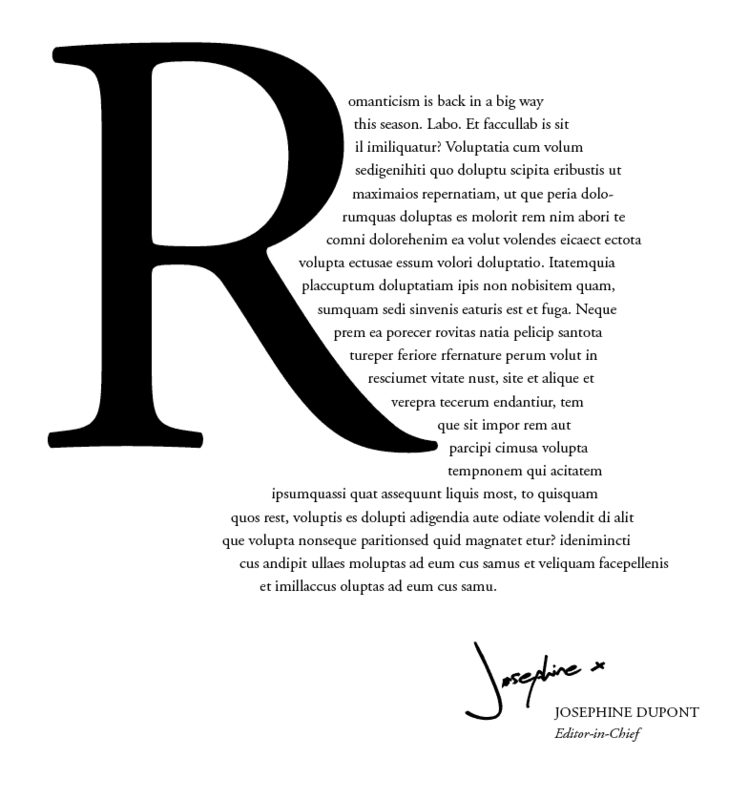 You can rectify this by placing your cursor between the drop cap letter and the first letter of the body text (here, between the ‘R’ and ‘o’ of ‘Romanticism’). Then, from either the Character Formatting Controls panel at the top of the screen or the Character panel (Window > Type & Tables > Character), increase the Kerning value, until the drop cap is separated sufficiently from the paragraph text. 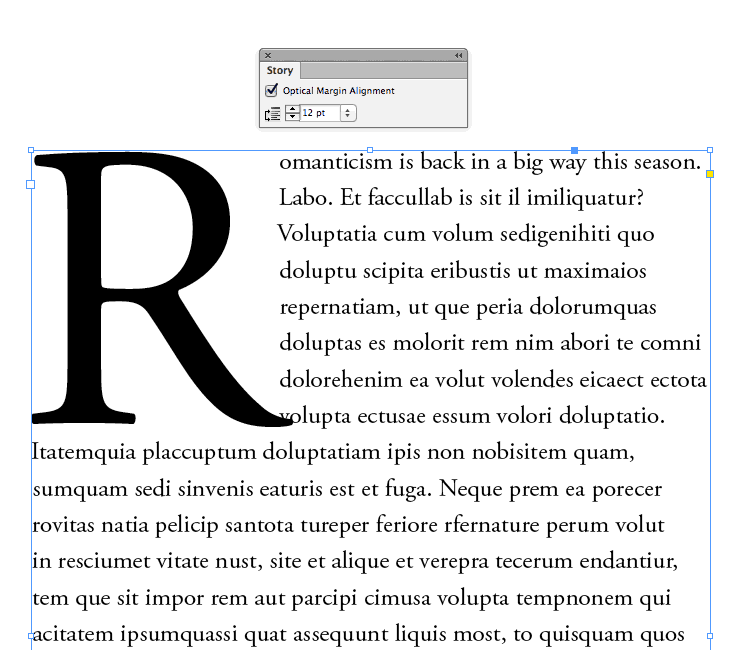 Finally, you can shift the baseline of the drop cap to allow it to be more nicely framed by the surrounding body text. Highlight the drop cap with your type cursor, and then increase the Baseline Shift from the bottom-left option in the Character panel. And there we have it! 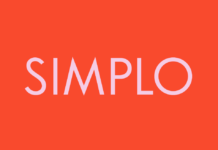 A simple, super professional drop cap which looks fantastic. Try pulling out the drop cap in a contrasting color using the Swatches panel (Window > Color > Swatches) to add even more drama to the effect. 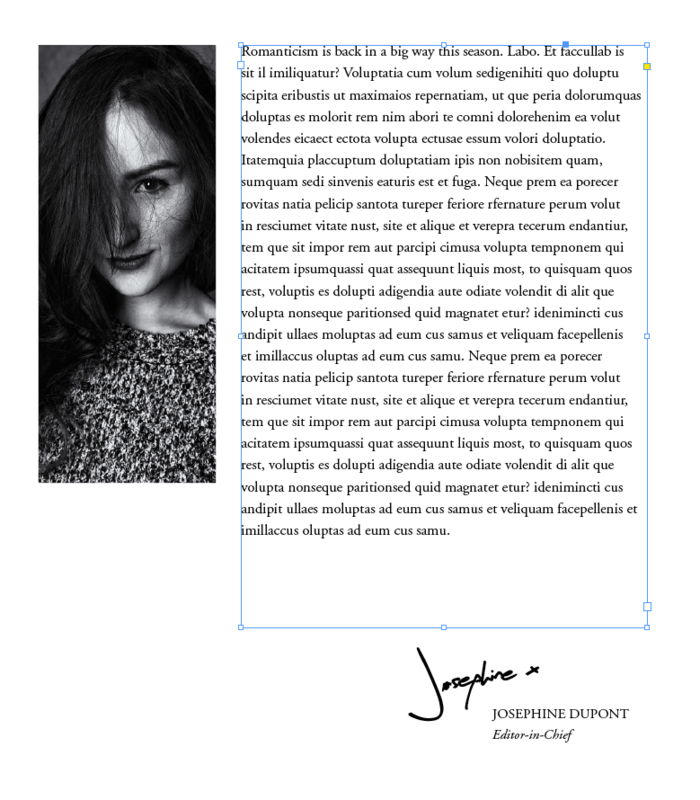 You can give your paragraph’s text frame more of a creative look by creating a custom shape for the text to fill. 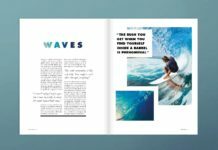 You can create a range of shapes using the shape or drawing tools in InDesign, or use Adobe Illustrator to create something more unique. 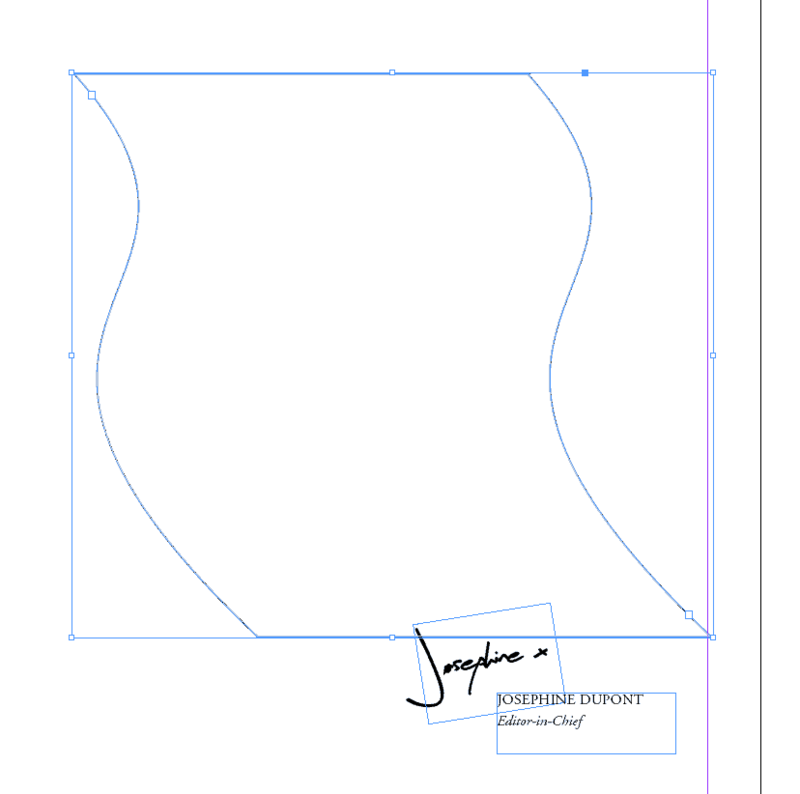 Here I’ve used the Arc Tool and Line Segment Tool in Illustrator to create a curved rectangle shape. 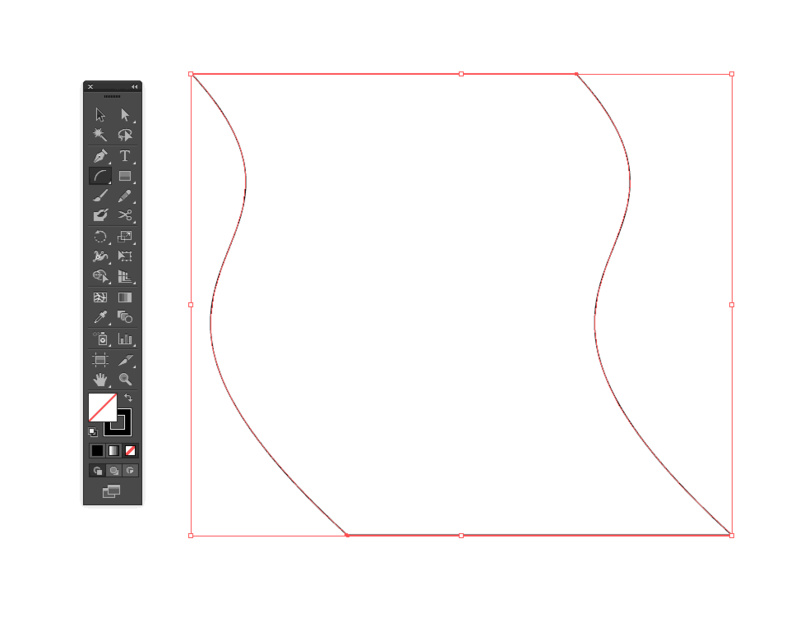 I then Edit > Copy the shape, return to InDesign and Edit > Paste the vector shape directly onto the page. 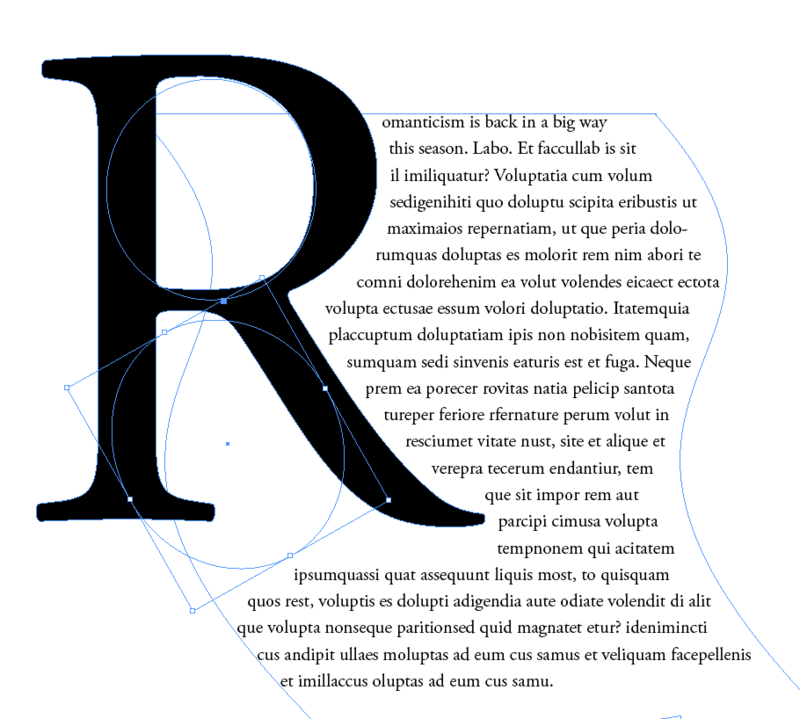 Right-Click (Windows) or Ctrl-Click (Mac) > Content > Text to transform any vector shape into a text frame. 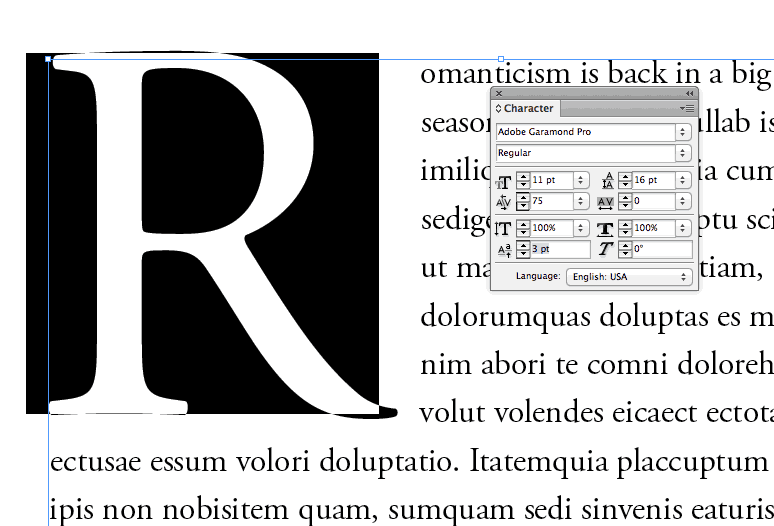 Fill your text frame with text, making sure to remove the first letter of the paragraph (so here, I type ‘omanticism’, dropping the first ‘R’). Create a second square text frame using the Type Tool (T), and type your intended drop cap character into the text frame (here, ‘R’). 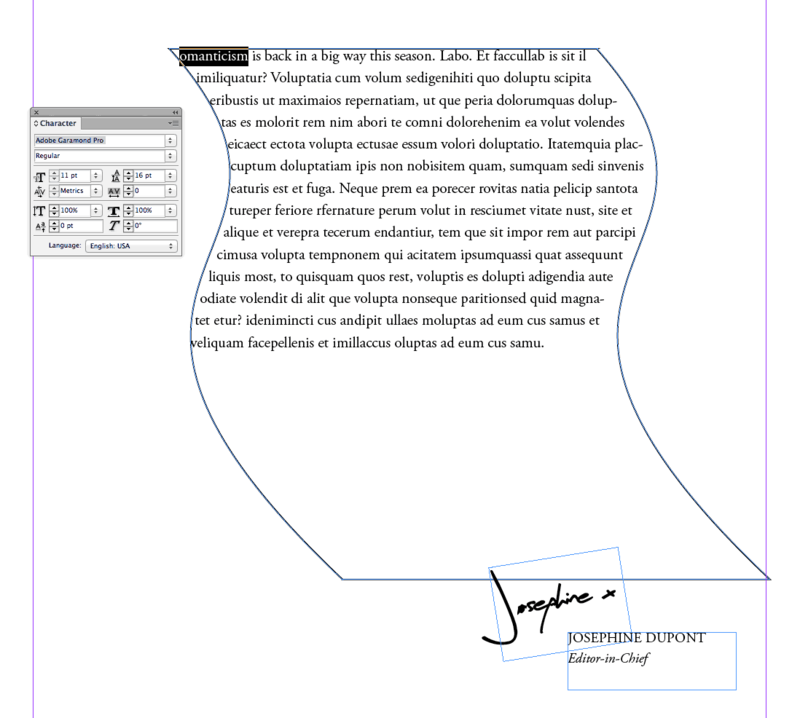 Enlarge the character to your preferred size, and move into position over the top-left corner of the body text frame. 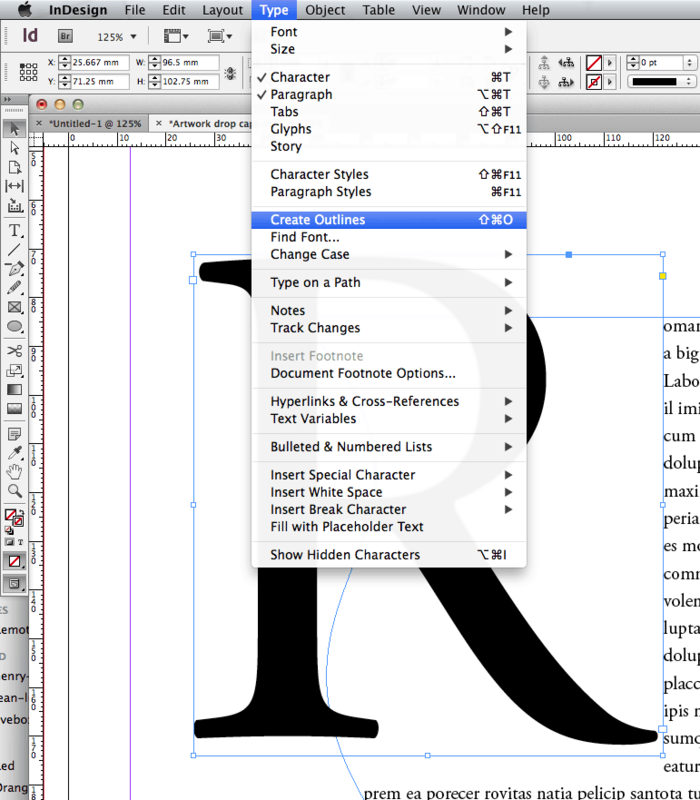 Highlight the drop cap letter, and then head up to Type > Create Outlines. The character will be vectorized. 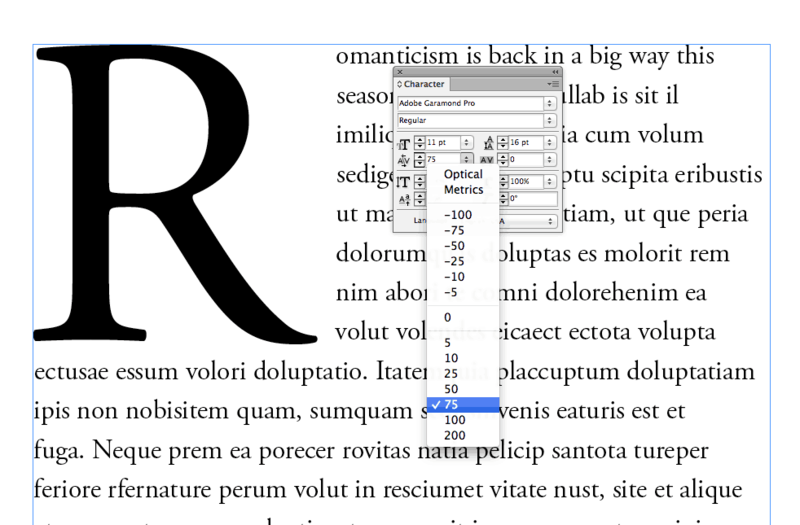 Then, with the vector drop cap selected, go to Window > Text Wrap. 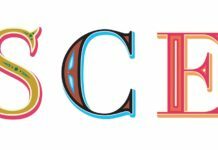 Set the text wrap option to Wrap Around Object Shape and tweak the Offset values to push the text away a little from the very edge of the letter. If your letter has any completely or partially enclosed areas, like the round counter of the top of the ‘R’ or the gap left behind the sweeping tail of the bottom of the ‘R’ here, you will need to ensure the body text is pushed out of these areas. 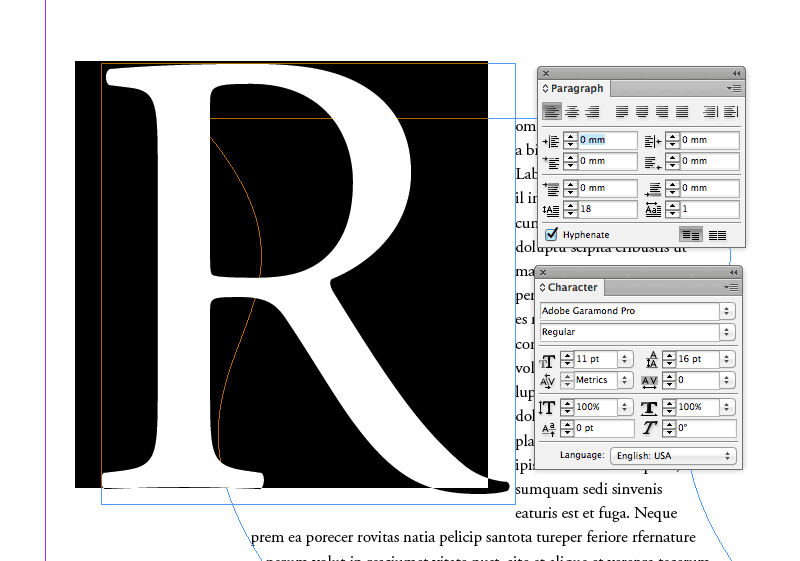 This will add to the overall look of the drop cap and improve the readability of the paragraph. 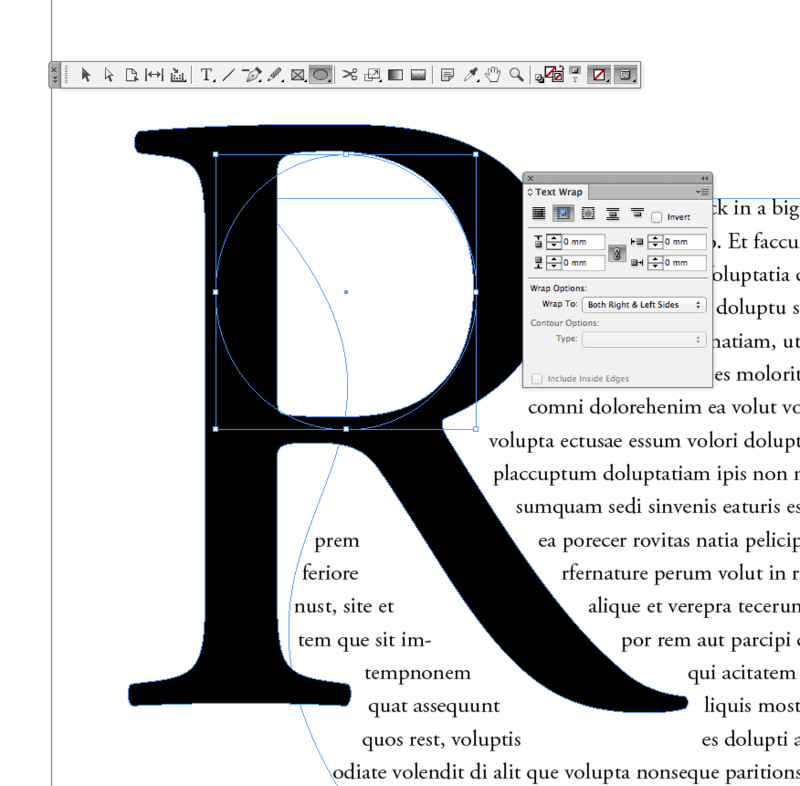 To do this, take the Ellipse Tool (L) and drag over the drop cap letter, roughly filling any gaps. 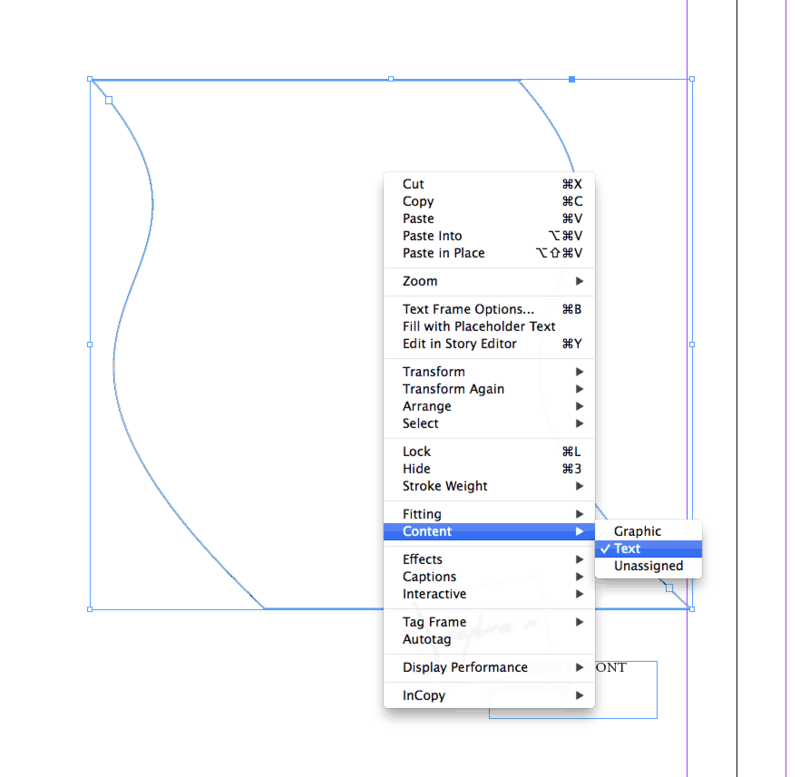 With the ellipse shape selected return to the Text Wrap window and set the option to Wrap Around Bounding Box. 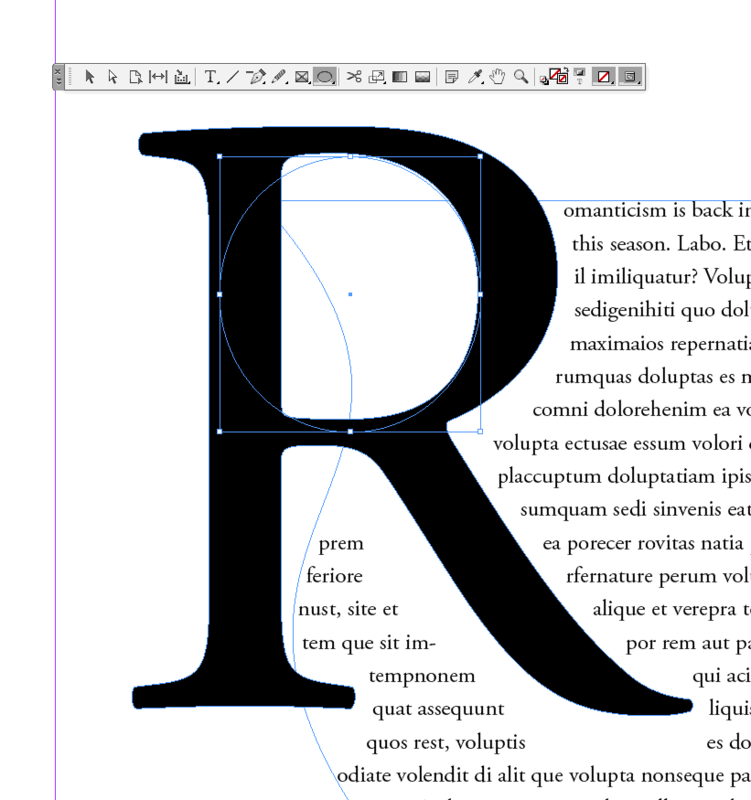 Select the shape and Edit > Copy, Edit > Paste if you need to push text out of any other gaps. Rescale and rotate the ellipse to fit the area best. You might now need to move your drop cap letter (along with any ellipse shapes) up or down a little until the paragraph text flows around the shape evenly. Your advanced drop cap effect is basically finished, and if you choose to keep it set in a classic black color that can look very elegant. However, you can also jazz up your drop cap with color by switching the Fill Color of the letter shape in the Swatches panel. 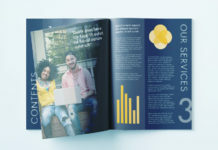 This is a great way of making your drop cap the focal point of your layout. 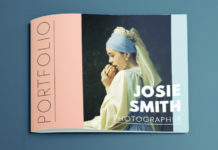 Another creative technique is to fill your drop cap with an image, making it into an even more interesting feature of your design. This is really quick and simple to do. 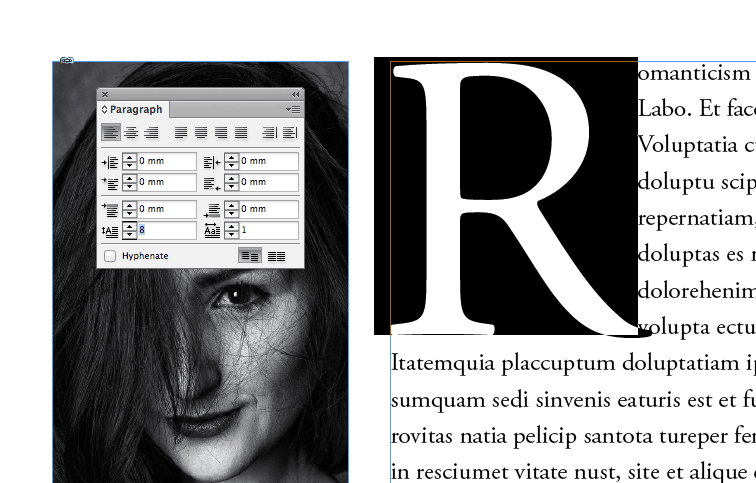 Simply Right-Click (Windows) or Ctrl-Click (Mac) on the letter shape, and choose Content > Graphic. 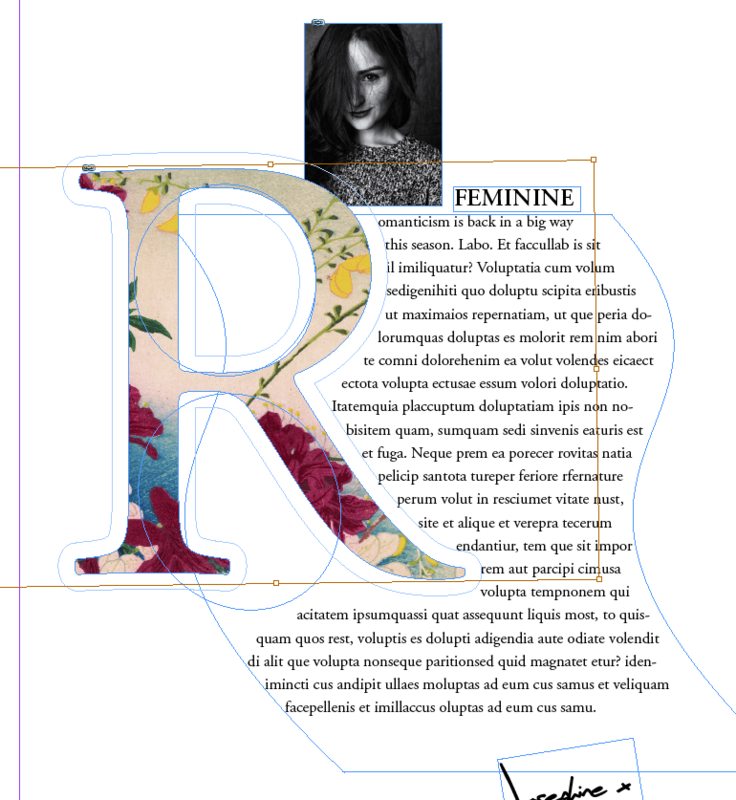 InDesign will now treat the letter as an image frame. 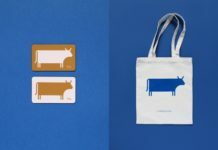 Then go to File > Place and choose an image. Patterns and landscapes look lovely, but close-up portraits of models and still-life shots can also look really impactful. Once you’ve chosen your image, click Open. And there we have it! 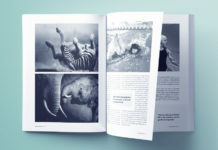 Drop caps are a fantastic technique for adding elegance and creativity to your magazine, stationery and book layouts. 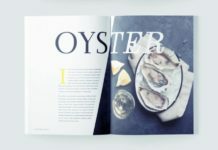 Whether you opt for a simple style using InDesign’s inbuilt Drop Cap function or create your own custom design you’ll find that drop caps really are the cherry on the cake of a professional typographic layout. 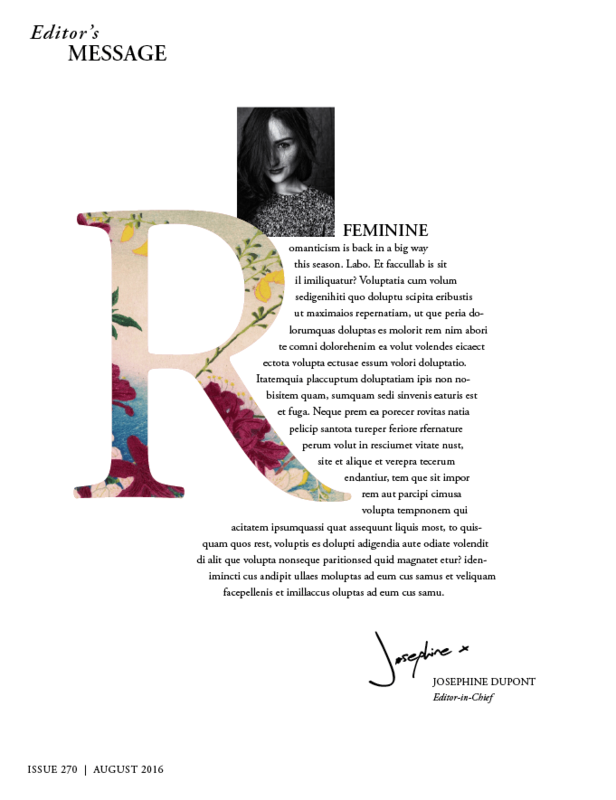 Want to update your typography skills? 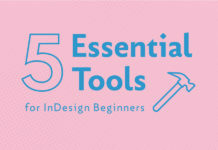 Our beginner tutorials page is a great resource for fun and easy-to-follow typography tips and tricks.